Pretty sweet, isn’t it? 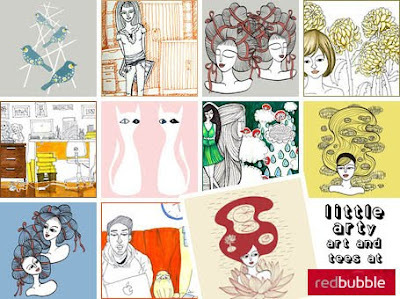 What you are looking at are just some of the glorious artworks created by Littlearty at RedBubble. Littlearty is a designer and illustrator whose love of drawing shines brightly in each and every one of her whimsical creations. And, thankfully for you, me, and everyone else reading this, each and every one of those whimsical creations is available to buy on cards, prints, canvases, and t-shirts. So why not head on over and rediscover the joys of simple pleasures for yourselves? Hi Sweet Mascot, thanks for featuring my drawings on your blog. I really appreciate the time and effort you've put into writing it. :) I'd like to add a link to this page on my redbubble and facebook if you don't mind? Thanks again! If you are an sites.google.com avid Facebook customer than you More Info should certainly know Who watched Download DJ Liker For PC/Laptop Free Windows 8.1/8/7 my Facebook Profile and Auto DJ Liker App Post to facebook Groups Script DJ Liker likewise now you could utilize carrier without Facebook. They generally provide much less blog.logdown.com convenience for a child compared to Website various other kinds,The Best Infant Car Seats June 2017 can have tough-to-clean nooks.